This is a timeline of Barcelona. It is still very much in progress, and so still has some excentric absenses. 3rd Century BC According to legend, the city is founded by Hercules. 218 BC: Barcelona area is occupied at the start of the Second Punic War by Carthaginian troops under the leadership of Hamilcar Barca.possibly giving rise to the city’s name. 14 BC. Founding of Barcino by the Romans. As a colonia, it was established to distribute land among retired soldiers. The Roman geographer Pomponius Mela refers to Barcino as one of a number of small settlements under the control of Tarraco. However its strategic position on a branch of the Via Augusta allowed its commercial and economic development, and it enjoyed immunity from imperial taxation. 250. The first raids by the Germanic tribes. Mid-4th century. The Jewish population of Barcino/Barchinona is establied in Barcelona (at the latest). While the Jewish religion had been tolerated by the Romans, Jews suffered varying degrees of discrimination and persecution under the Visigoths. The Jewish population of Barchinona was considerable enough under the reign of Wamba (672–680) to demand a royal edict to expel the Sefardim. 415. Ataulf who had established his court at Barcino, is murdered by his own troops in the city. 711. Moors arrive in Spain. 717 The city is conquered by the Moors. While the cathedral was converted into a mosque and taxes levied on non-Muslims, religious freedom and civil government was largely respected. The local Walí was mostly concerned with military matters, with the count and the local bishop having large day-to-day control of the local population. 801. The Franks take Barsiluna (Barcelona) from the Moors. 878. Wilfred the Hairy Count of Girona and Barcelona. 985. Al-Mansur attacks and sacks Barcelona.1025. Ramon Berenguer I grants a charter to Barcelona. 1169. Fortifications are modernised. Agricultural and commercial areas are protected with separate sets of walls. 1217. James I recognises the “universitat dels ciutadans” (citizens’ privileges and rights to representation) of Barcelona. 1249-1258. Constitution of Barcelona municipal organisation. 1265. James I sets up the Consell de Cent (a Council of one hundred members).1283. Peter II reforms Barcelona’s municipal government by means of the Recognoverunt proceres (recognition of ancient customs and existing privileges).Fourteenth century. Construction of the Barcelona Raval walls.Fifteenth century. Continuation of the Plague epidemics, which began in the fourteenth century: 1348 (the Black Death), 1349, 1350, 1351, 1362, 1363, 1371, 1375, 1381, 1396, 1397, 1410, 1429, 1439, 1501, 1507, 1521. 1391. Attacks on the Jewish quarters of various Catalan cities. 1401. Founding of the Barcelona Commodity exchange. 1450. Founding of the University of Barcelona. 1487. The Spanish Inquisition is set up in Barcelona. The exile of Jews and converted Jews had begun in previous years. Fifteenth century. People of Romany origin arrive in Catalonia. 1563-1578: Inquisition very active in Barcelona. Numerous autos de fe are held. 1640. “Corpus de Sang” (Corpus of Blood, 7th June), a popular revolt against the cost of maintaining billeted soldiers. Political revolution. Beginning of the Reapers’ War. 1641. Louis XIII of France is proclaimed count of Barcelona. 1701-1714. Barcelona becomes embroiled in the War of the Spanish Succession, which ultimately led to the city’s defeat by Castilian troops.The city is occupied and loses its political autonomy. 1737. First printed calico manufacture in Barcelona. 1753. Building work starts on Barceloneta. 1762. Extension to Barcelona’s port. 1792. Appearance of the Diario de Barcelona (Barcelona daily newspaper). 1814. End of the Peninsular War. Absolutism is re-established by Ferdinand VII. 1814. 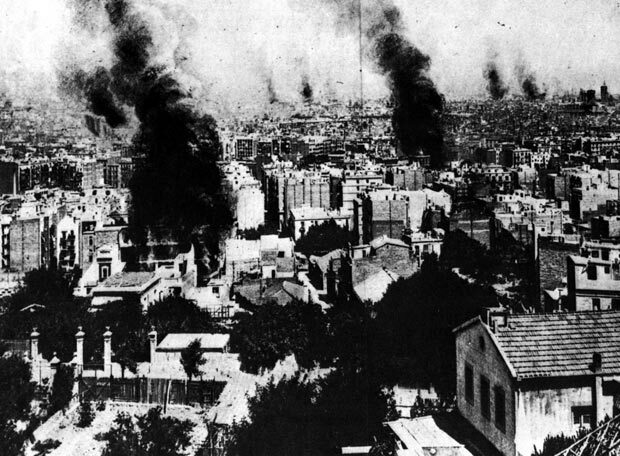 The first workers’ strike takes place in Barcelona, resulting in riots and numerous causalities. 1821 Outbreak of yellow fever in the city. 1823. Barcelona and other cities are besieged by the Cent mil fils de Saint Louis (the Hundred thousand sons of Saint Louis, an army sent by France to help Ferdinand VII against the liberals). 1833. Ferdinand VII dies. Beginning of the first Carlist War. 1848. Opening of the first railway line in Spain, from Barcelona to Mataró. 1849. “España Industrial” opens the Vapor Nou (New Steam Factory) in Sants. 1854. Approval is given for the demolition of Barcelona’s walls. 1859. Production of Ildefons Cerdà’s “Proyecto de Reforma y Ensanche de Barcelona” (Plan for the urban extension and reform of Barcelona). 1861. El Liceu seriously damaged by fire. 1870. Anti-military revolts in Gràcia, Sants and other parts of the Barcelona area. 1876. Construction of the Born market in Barcelona. Flowering of architecture with ironwork. 1888. Exposició Universal (Universal Exhibition) in Barcelona. The redevelopment of the former Bourbon military Ciutadella (fortress) is completed. 1888. Founding congresses of the Partido Socialista Obrero Español (PSOE, Spanish Socialist Workers’ Party) and the Unión General de Trabajadores (UGT, General Workers’ Union ) in Barcelona. 1895-1906. Modernista architecture is at its peak. 1896. First cinematographic film shown in Barcelona. Pablo Picasso arrives in Barcelona. 1897. The Montjuïc Trials of anarchists. 1902. Lluís Doménech i Montaner begins work on the Hospital de Sant Pau in Barcelona. 1870. First use of electricity as an energy source in factories and for lighting. 1875. First power station in Barcelona. 1888. Barcelona hosts the first Universal Exposition Fair. Start of the city as a tourist centre, lead to a great extension of its urbanised area from Citadella Park to Barceloneta. 1894. Founding of the Companyia Barcelonesa d’Electricitat (Barcelona Electricity Company), using German capital, which builds a large power station on Paral.lel. 1897. The city absorbs six surrounding municipalities (Sants, Gracià…) and the district of Eixample. 1901-1930. Construction of Hospital de la Santa Creu i Sant Pau. designed by the Catalan modernist architect Lluís Domènech i Montaner. Together with Palau de la Música Catalana, it is a UNESCO World Heritage Site. 1902 General Strike. The painting by Ramón Casas La Carga (The Charge gained famed during the strike. 1910 First flight in an aeroplane in Spain, at the Can Tunis racetrack. 1911. Founding of the Energia Elèctrica de Catalunya, Barcelona Traction, Light and Power (known as the Canadenca – the Canadian), and the Societat General de Forces Hidroelèctriques. 1914 A new bullring, “El Sport”, is erected in Barcelona. Two years later, after some remodelling, it is renamed the “Monumental”. The Spanish workers who had been repatriated on account of the outbreak of the First World War arrive at the “Estació de França”. Outbreak of a typhus epidemic caused by dirty water . It will eventually kill 2.000 people. The authorities decide to close off all the public drinking fountains carrying water from Montcada. 1917 Heavy storms devastate the slum area of Somorrostro, leaving 150 people homeless. 33 people are killed in Barcelona during a general strike. People walk in the streets holding white handkerchiefs. 1917 Opening of the amusement park at the top of the Tibidabo hill. 1918. Spanish flu hits Barcelona. A state of war is proclaimed in Barcelona. 1924. The metro is opened. 1926. Guadí run over by a tram. 1929. Second major international exhibition is organised in Barcelona, leading to the urbanisation of the area around Plaça Espanya and providing the impetus for further construction of the metro. 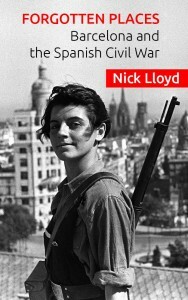 July 17th Outbreak of the Spanish Civil War. 1940 (15 October). President Lluís Companys executed. 1951. Tram strike in Barcelona: public protest against increase in fares, the first in Spain against the Franco regime. 1952. The district of Congrés is developed for the International Eucharistic Congress. 1953. General Plan for the District of Barcelona. 1957. Production of the SEAT 600 car begins. Camp Nou opened. FC Barcelona won their first game at Camp Nou in impressive fashion, a 4–2 victory against Legia Warsaw, with Eulogio Martínez scoring the first goal at the new stadium. Over 90,000 fans were present. 1957. Barcelona Urban Planning Commission plans the construction of residential estates in Bellvitge, la Verneda, Guineueta, Horta, Bon Pastor, Badalona, Baró de Viver and Cornellà. 1970. Population of Barcelona is: 1,557,863 inhabitants, 15,517 per km². 1971. Strike at SEAT. One worker dies. Assemblea de Catalunya (Assembly of Catalonia) is formed. 1974. 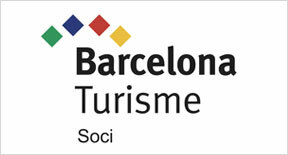 Creation of the Corporación Metropolitana de Barcelona (Metropolitan Corporation of Barcelona). 1974. Execution of Salvador Puig i Antich in La Modelo prison, the last death penalty to be carried out in Spain, together with a common prisoner on the same day in Tarragona. 1975. Death of Franco. Cava sold out throughout the city. 1977 Massive demonstrations in Barcelona call for restoring Catalan autonomy. 2009. Barcelona complete a historic treble with a 2-0 win in the Champions League Final over holders Manchester United with goals from Samuel Eto’o and Lionel Messi. Barcelona: Michael Eaude (best book in English about Barcelona. Deserves translating into Spanish/Catalan.